Access to breast care and prevention remains a huge challenge for more than half a billion women around the world! We are launching this year’s Breast Cancer Awareness Month with some new resources, including our new LEARNING BRIEF on Access to Cancer Screening for women with disabilities and Deaf women, chock full of concrete examples of what’s working and what can be done to increase access to health care services and improve on the low screening and higher morbidity rates we find still in women with disabilities and Deaf women. We are also sharing a really powerful INFOGRAPHIC from our friends at the World Health Organization which illustrates the global scale of the problem. 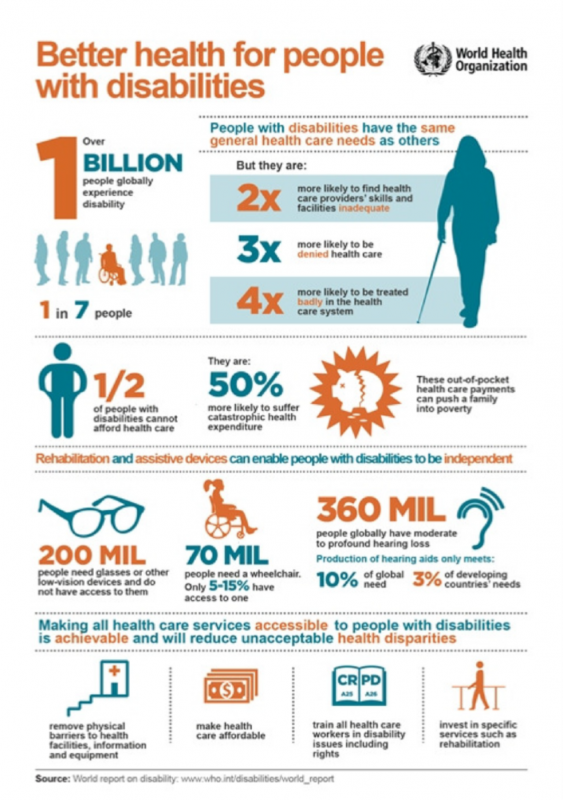 The WHO information reminds us that people with disabilities have the same general health care needs as other people but are 3 times more likely to be denied health care and 4 times more likely to be treated badly in the health care system. In a Canadian context, despite our coveted health care system and a fairly well developed breast cancer screening strategy, we know from the research we conducted for the Canadian Breast Cancer Network (Environmental Scan on Women with Disabilities and Breast Cancer Screening: Identified Problems, Strategies and Recommended Next Steps) and the higher incidence of death, that women with disabilities and Deaf women in Canada have not been receiving adequate prevention services, including screening. Through our most recent community development research OUR HEALTH MATTERS we know too that women have described experiences of physical and verbal abuse, bullying and neglect in seeking health care services. Identified barriers include lack of access to ASL/LSQ video or Interpreters, lack of communication supports for women who are non verbal, or English/French for whom one or the other language is not spoken, depending on where in Canada she might live. Transportation, including access, flexibility and affordability are also a huge barrier. Health promotion and outreach particularly to our Community requires a commitment (and resources) to addressing system change and a strong focus on educating both health care providers and women with disabilities. For Service Providers: Begin with understanding that you are addressing a systemic problem and that means systemic changes that include your outreach first, then your intake protocols. You need to addressing not just the physical (architectural, equipment, materials) barriers, but also the ones that are embedded in attitudes. Look at your staffing and hiring policies and create change in your organization’s culture from within! For our own community – we need to be our own advocates, so ask for a longer appointment if you need it. Ask about accessibility of the clinic on the telephone before your appointment.. Seek out service providers who have the expertise and sensitivity to respond to YOUR health needs. Focus on accessing a variety of health and wellness sources and on learning more about how to avoid stress and prevent illness because #OurHealthMatters too!